Today I found out nearly all commercial banana plants are perfect clones of one another and most originate from one single plant from Southeast Asia. Now to be clear, there are approximately 1000 different types of banana plants in the world today and within each variety most are generally clones of one another, although some do have a bit of genetic diversification. But “the” banana, since the 1960s, the one sold commercially in supermarkets the world over, is the Cavendish banana. Most types of bananas originate from hybrids of the Musa acuminata and Musa balbisiana. When these two cross breed, the result is a half breed banana plant that is almost completely sterile. The first records of these half breed banana plants being cultivated dates back around 10,000-15,000 years ago, making it one of the oldest known cultivated plants. Because this mutant plant was unable to breed on its own, agriculturists had to find another way to propagate the plants. There are a few different ways to do so, but the most popular is to simply take a shoot, called a “sucker”, off an existing plant and plant it elsewhere. Even if the sucker has no roots, if placed in the correct type of soil (wet sandy soil), it will develop them in time. The banana plant was gradually developed into varieties we see today and propagated throughout the world initially by Arab traders and later Spanish conquistadors. So a hybrid plant that normally would have died off quite quickly has been spared by human intervention, with humans’ simply taking shoots from desirable existing plants and spreading them throughout the world. The advantages to this is that among each variety, they are nearly all perfect clones of one another, which means as a commercial product, a Cavendish banana from some Cavendish banana plant in Africa will taste and look the same as one from South America. There is one huge drawback however. Because they are clones, what will kill one, will kill them all. Interestingly, the Cavendish banana was not the world’s most popular banana until the 1960s. In fact, it was relatively unknown among the masses and even after the 1960s the former world’s most popular banana, the Gros Michel or “Big Mike”, was generally preferred by businesses and consumers alike. The Gros Michel was preferred by businesses due to being easier to ship and they stored longer before spoiling than the Cavendish. Consumers also liked them better for the increase in storage time as well as the fact that they are larger and sweeter and generally considered to taste better. The latter being one of the reasons it was the world’s most popular banana in the first place. Unfortunately, the world was forced to switch bananas in the middle of the 20th century. So what happened to force this switch? What happened was a banana apocalypse on a global scale. You see, the drawback of the fact that within each variety of banana nearly all the bananas are clones of one another is what will kill or harm one banana plant will do the same to all other banana plants of the same variety. Enter the Panama disease which caused the near extinction of the Gros Michel Banana. Panama disease is a type of fungus that lives in the soil and to which fungicides do not work against, which is why it is such a threat. There are a variety of strains of this fungus out there, one of which wiped out the Gros Michel Banana as a commercial product. It was around the 1920s when this particular strain of the Panama disease first showed up in Sirname. From there, it spread quickly through the Caribbean and eventually throughout the banana growing world. By the 1960s, due to the mass wipe-out of the Gros Michel, banana growers were pretty much all nearly bankrupt and were desperately trying to find a way to stay afloat. Enter the Cavendish banana, which is smaller, but somewhat similar tasting to the Gros Michel, only less sweet and more care needed in its shipping and storage. But just as important as the similar taste was that it was resistant to the particular strain of the Panama disease that wiped out the Gros Michel. A few billion dollars in infrastructure change later and growers successfully made the switch, with the mass public accepting the new banana in place of the Gros Michel. Unfortunately, a new strain of the Panama disease, that the Cavendish banana is not resistant to, sprung up in 1992 and threatens the world’s most popular banana once again. This time however, there has not yet been found a similar substitute banana among the other 1000 or so varieties out there. Most varieties of banana contain giant hard seeds throughout the soft fleshy inside and generally taste nothing like the bananas we are used to eating. A second banana apocalypse, if it happens soon before a new variety can either be genetically engineered or carefully bred, will likely see the end of the fruit as a popular commercial product. Since this new strain of Panama disease has showed up, it has already wiped out plantations in Indonesia, Malaysia, Australia, and Taiwan and is currently spreading through Southeast Asia. It is also thought that it is only a matter of time before it spreads through Africa and Latin America, which would be the death knell for the Cavendish as a commercial product. Because of this, extremely strict cultivation rules and regulations are in place to try and protect the commercial plantations from becoming infected. Some experts even say this should be sufficient to stop the commercial extinction of the Cavendish banana from ever happening. But many experts feel this is naive as similar efforts were put forth to try and protect the Gros Michel before its eventual commercial extinction. Although, we do have the benefit of better technology today to aid in protecting the plantations. However, even with this, most experts feel it is only a matter of time before Cavendish bananas will no longer be available in stores. Bananas do not grow on trees. Rather, they grow from a root structure that produces an above ground stem. The plant is specifically classified as an arborescent (tree-like) perennial herb; in fact, it is the largest herbaceous flowering plant. Just as interesting as the banana plant being an herb is that the banana itself is a berry. Over one hundred billion Cavendish bananas are consumed annually in the world. Cavendish bananas are named after William Cavendish, the 6th Duke of Devonshire, who originally acquired one of the early specimens and developed cultivars for commercial uses of the plant. Bananas are one of the healthier natural food sources in the world, ounce for ounce. They contain almost no fat; are very low in calories; and are high in vitamin B6, fiber, and potassium. They also contain decent amounts of phosphorus, magnesium, calcium, iron, selenium, manganese, copper, zinc, Vitamin A, Vitamin B1, Vitamin B2, Niacin, Folate, Vitamin C, Vitamin E, Vitamin K, and Pantothenic Acid. Bananas are also known to lower the risk of heart attacks and strokes, as well as decrease your risk of getting cancer, according to the FDA. Another popular fruit that, like the banana, are all clones of one another is the Navel Orange. These are nearly all direct descendants and clones of one original tree that lived in Brazil in the mid 19th century. A cluster of bananas is formerly called a “hand”. Along that theme, a single banana is called a “finger”. Americans eat more bananas than any other fruit, with an average consumption of 26.2 pounds of bananas per American per year. In fact, Americans eat more bananas than apples and oranges combined. The number two most consumed fruit for Americans is the apple at 16.7 pounds per person per year. Bananas are the fourth largest agricultural product in the world, following only wheat, rice, and corn. The country with the most bananas consumed on average per person is Uganda. Ugandans eat on average around 500 pounds of banana per person, per year. Commercially, bananas are harvested while they are still green. 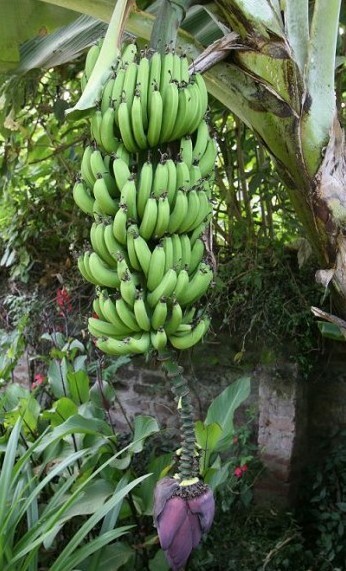 The harvesting, shipping, and eventual delivery to the supermarket shelves must be timed perfectly as Cavendish bananas provide a very small window of ripeness. One harvester states, they used to “wait until you could see the ship coming over the horizon toward port.” They would then frantically harvest the bananas and rush the crop to the boats. Today, a slightly more sophisticated system is used with radio networks replacing the “watch for the boat” method. They also store the bananas in refrigerated units to slow the ripening process and use bar coding systems to track each hand. One of the few other somewhat accepted varieties of banana is the Goldfinger banana, which doesn’t taste like the Cavendish or Gros Michel at all, rather tastes a bit like an apple. 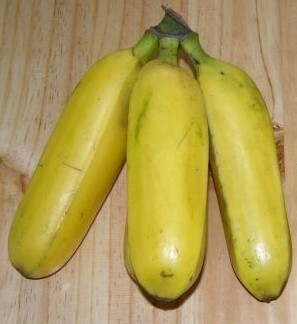 This variety was a hybrid bred banana created by Philip Rowe. It did not catch on commercially in most of the world, excepting parts of Australia. A single banana plant will typically grow about twelve hands per bunch, a “bunch” being the entire output of a single plant at a given time. For the past decade or so, workers in Brussels, Belgium, have been working to decode and manipulate the banana’s genes. Their goal is to create a modified Cavendish banana that is resistant to the new strain of Panama disease, as well as the less threatening Black Sigatoka (a kind of worm), which also kills Cavendish banana plants. Banana leaves are waterproof and generally very large. As such, in certain parts of the world, they are used as disposable plates and food containers. They also are often steamed with other foods; the juices from the leaves protect the food from burning and give the food a sweet flavor. These leaves also make great umbrellas. In Japan particularly, banana plants are prized for their fibers which are used to make a variety of cloth materials ranging from table cloths (from the more coarse fibers) to high quality kimono and kamishimo (from the softer inner fibers). Banana sap makes a very good natural adhesive as it is extremely sticky. The term “Banana Republic” was coined for states that were primarily run, whether behind the scenes or publicly, by large banana companies who generally would support some dictator whose primary purpose was to protect the banana companies and ensure large, cheap crops. The round dark center on the one end of Cavendish bananas is not a seed, but rather the vestige of what would be the fruit’s reproductive core, if it had one. The process of growing hybrid bananas must be done by hand as cultivated bananas never reproduce sexually on their own. Instead, humans must gather pollen from the males and transfer it to receptive female flowers. From there, it takes about four months for a pollinated plant to bear fruit. This fruit is then harvested and processed for seeds. For each hand pollinated plant, only about 1 in 300 bananas will produce a seed. Only about 1/3 of those seeds will germinate. About two years later, these new hybrids will begin to produce fruit of their own and cultivators can then see if they’ve created something that is tasty and sustainable. The odds of one of those above seeds that germinates creating a sustainable hybrid is about 1 in 10,000. If one does produce a sustainable hybrid, these hybrids are then examined for favorable characteristics and possibly will be used in creating future hybrids. Needless to say, creating banana hybrids this way is a long and tedious process with very little chance of producing a commercially viable hybrid banana before the Cavendish is inevitably wiped out or genetically modified to allow it to survive. Although no longer viable for mass cultivation, the Gros Michel still grows in certain areas of the world that has not been touched by the particular strain of Panama disease that wiped it out as a commercial product. For similar reasons, the Cavendish is not likely to ever be completely wiped out, though it is thought it will eventually go the way of the Gros Michel and eventually no longer be commercially available. Today there are about 70 million people in the world that depend on the banana for one of their primary food sources, as well as the plant’s uses in making clothing, paper, and other common household products. The strain of Panama disease that currently threatens Cavendish bananas is called “Race 4″. Also all navel oranges today were because of one mutation that left a tree sterile, they were grafted to form other trees. Oh, you already mentioned the Navel, I didn’t see. sorry.